Great shots of a very elusive and "difficult" subject. Like you, we associate them with deep tree-fern gullies, mostly working the trunks and branches of trees, though sometimes foraging across the ground. 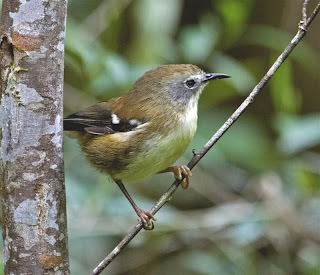 However, the clearest view of one we ever had was on the Dove Lake circuit at Cradle Mountain, where we came across a Scrubtit foraging, very tree-creeper-like high in the branches of a bare, dead Eucalypt, about 5m to 6m up, and totally exposed in full sunlight. Unfortunately, it would not sit still for a photo, and eventually flew of into another patch of scrub, well off the walking track. Most unusual behaviour! Thanks for commenting. One of the pairs had a territory close to a burnt area, and I was surprised to see one of the Scrubtits foraging in burnt scrub far from any real cover, so perhaps (when they're feeling brave), they forage more widely than we generally believe. The 'integrated' use of the area by Tas Thornbills, Tas Scrubwrens, Bassian Thrushes and Pink Robins is worthy of further study. Wow these are really nice shots of a bird I was beginning to believe did not exist. After living in Tassie all of 1971 and not seeing any Scrubtits my wife and I allocated two weeks around Hobart to try and find them. It took twelve days to located them! Sharland said they were getting scarce around Fern Tree fifty years ago but as people were reporting them from there recently we looked until we found them. Again wish we had seen your blog before our return trip. Many thanks for some good photos.